Flashlight games are great nighttime activities kids love. Grab your flashlights. Get set. 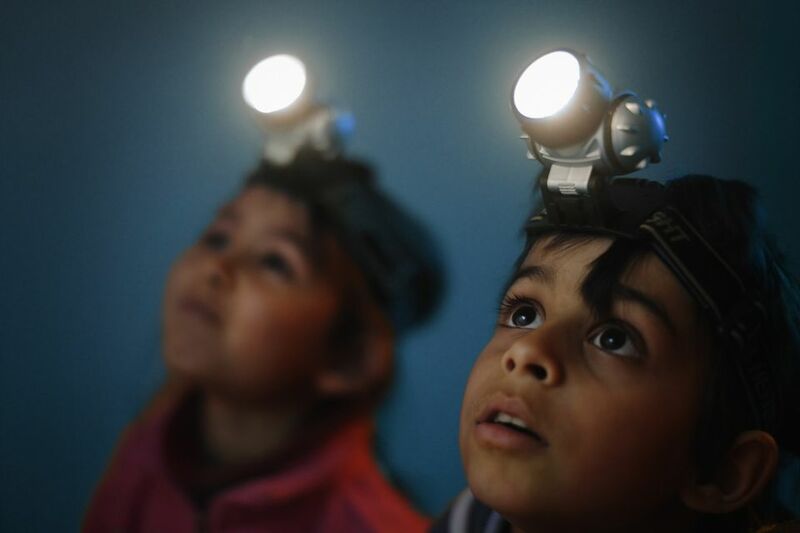 Go try these 9 fun flashlight games kids can play inside or out. Catch giant fireflies with the flashlight firefly game. These giant fireflies are actually kids. The rules are simple. One or more children designated as fireflies each get their own flashlight. They flash the light on the flashlight once about every 30 seconds while the other children who aren't fireflies try to capture them. Flashlight tag is one of the oldest, best known and loved flashlight games. Think tag and hide-and-seek in the dark. Flashlight tag's rules vary but the basic premise is one person is "it" and tries to spot his friends hiding in the dark using the flashlight. What pictures will your kids create when they draw pictures with their flashlights? This fun flashlight game requires a camera capable of a long shutter speed and flashlights for your light source. Pictures can be simple, such as a smiley face. For more advanced flashlight gamers, get creative with flashlight drawings over objects like a couch, other people or the family pet. If your kids know how to play charades, then they're just about ready to play a game of shadow charades. It's the concept of shadow charades meets shadow puppets. A parent can tell each player which shadow charade he will be acting out. When it's his turn, he stands at a wall in the dark with a flashlight beamed at his hands. He tries to make shadow puppets on the wall that reflect the word he's been given. Players make their guesses. Kids love to watch the flashlight dart around the room. In this game, their goal is to catch the light. Move the light all around the room, including on the ceiling, the walls and on the floor. At random times, stop the light. The kids are trying to catch the light so when you stop, they'll all run to the light to try and stomp on it if it's on the floor or jump for it if it's on the wall. This is a fun one for kids just learning their letters. Buy small foam letters and put them in the spotlight during your flashlight fun. Have the kids look at the wall as you hold up a foam letter in front of the flashlight. The foam letter's shadow will magically appear on the wall. The first one to name the letter wins the point. How low can you go with this flashlight game? Instead of limbo with a pole, play limbo with a flashlight. Lower the flashlight after each round, just like a limbo pole. If your body breaks the beam of the flashlight as you pass underneath, you're out. This is a fun flashlight game for older children or you can adapt the rules for younger children by making gameplay easier. Everyone needs a flashlight to play or players can be split into teams with each team leader given a flashlight. Hide items around the house or outdoors like a typical scavenger hunt and provide clues along the way. When it's dark, let the kids use their flashlights to find their treasures. For even more flashlight fun after dark, throw a dance party. Parents know that sometimes the best kid-energy burner is to simply dance it off. Grab the flashlights and let the kids make their own disco ball as they have their own dance party. Crank up the tunes and watch the lights shine all around the room. Guaranteed to bring lots of giggles and exhaustion to your evening. If you're not up to playing any flashlight games, there are many other daytime activities to try for a kid's birthday.